Research shows that while the majority of the poor have only short spells of poverty, the longer the poverty spell the harder it is to exit poverty and the greater the likelihood of permanent social exclusion. Time matters in poverty because in short periods of very low incomes people can rely on their savings to cope with the situation, but when poverty spell gets longer, these additional resources are exhausted. There is no cent left in the savings account, no more jewellery to take to the pawnshop, but also less friends around to offer help and more arrears to stress about. Poverty is not a static state, but it develops over time. The length of the poverty spell will provide us with more information on the severity of the condition. The persistent at-risk-of-poverty rate, defined as the share of people who are currently poor and were poor also 2 out of the 3 previous years, identifies people who live with a low income for long periods of time, as opposed to people who face transitory poverty. In this chart we present the share of the poor who are persistently poor (click to enlarge). Author's calculations based on longitudinal data from EU-SILC (European Union Statistics on Income and Living Conditions). Person is considered as poor if her disposable income falls below 60% of the country's median income. Only people present in the data for 4 consecutive years are considered. Red lines denote EU averages. This chart shows that focusing only on at-risk-of-poverty rate (AROP) does not give us a full picture of poverty. Countries with a similar AROP (on the y-axis) can have very different poverty dynamics (on the x-axis). Look at Sweden and Denmark on the bottom side of the graph, for instance: similar AROP, but very different shares of poor who experience poverty over long periods of time. Similarly Spain and Romania on the top side have equal poverty rates, but in Spain the share of persistently poor is less than 70 per cent, while in Romania it is almost 80 per cent. The take home message from this chart is that it is important to protect people from permanent poverty and to identify the individuals at risk of long term poverty to design effective preventive policies. While poverty is never a pleasant experience, regardless of its duration, the longer one spends in poverty, the harder and more insidious it becomes. 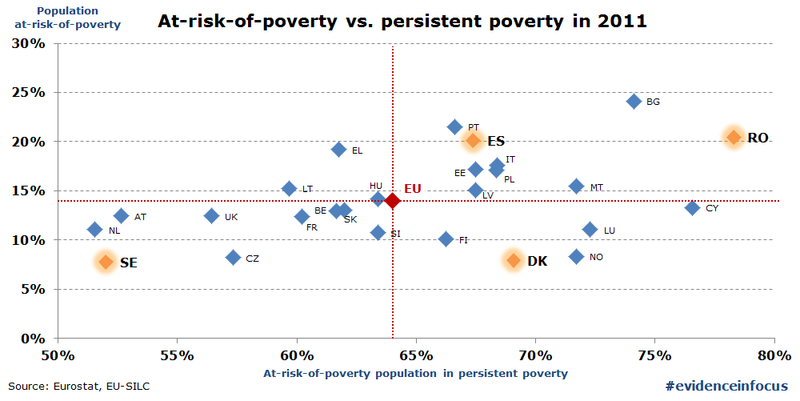 To read more about duration of poverty and poverty dynamics in the EU, see our new working paper. Author: M. Vaalavuo is a socio-economic analyst at the Social Analysis unit of DG EMPL. Editor's note: this article is the first of a regular series called "Evidence in focus", which will put the spotlight on key findings from past and on-going research at DG EMPL.